Me too. I love the pants. Loose, high on the waist, and just that perfect khaki. Wow! It’s all about the sneakers!! True demode…the overall look is out-of-date…the only thing which is cute are the two different sneakers…other than that…looks like a scarecrow. If Charlie Chaplin and Annie Hall had a son…..
Love the look of this updated Charlie Chaplin. Silent film star. Love it! Getting some Jacques-Henri Lartigue vibes from this one. Wow, seems simple enough but wearing two different types of sneakers is daring. Love it. I love his hat and his pose is interesting. I feel some kind of vintage vibes going on, but I adore that bag! I love the total commitment and fidelity to his style. He’s picked his vibe, and he’s not compromising. I see you, Sir. I wouldn’t try to copy you, but I’m not supposed to. Kudos to you, Friend. Follow the sign at your local supermarket that says…trash/garbage bags! I LOVE THIS LOOK! Well worn, unqiue clothing that speaks of personality, and not the mainstream consumerism. Rather preserving history and traditions bringing them with him into the future, knowing what fits him and how he is going to set his footprint on the small stories of history. Knowing what fits him. Either a wholesome, thoughtful, conscious of the extreme harms of buying some fashionable, large quantities of clothing. Or. A very well fabricated look with the motive of looking mysterious. Only like the pants. His attire is like denoting how much attention he put to each detail, too studied, and I don’t when it’s that obvious, then it results to me like a costume. You hit the nail on the head Alejandra…too studied…a costume. I find the effort put to this whole outfit rather off-putting. Some of the above comments are really interesting in trying to decipher the look but I think that at the end of the day what we have here is a cute attention seeker with an eye for detail. Was this at a Chaplin film festival? The guy has a sense of humor…is that so bad? I wish I’d see less judgement and folks just have an ability to smile at someone who pokes a bit of fun at all the fashion gods. Go Sixers – Go Philly!!!!!! I love his Sixers pin ???? 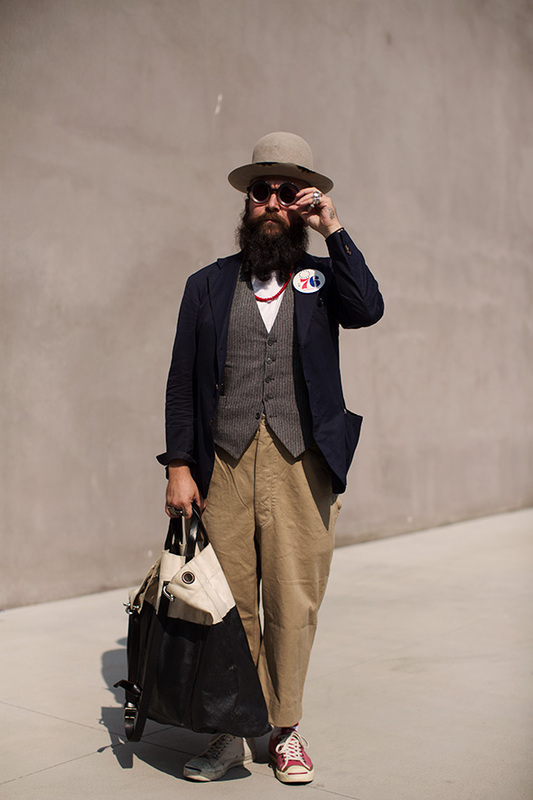 This is a criticism od someone featured on The Sartorialist? Is that not the definition of what almost every single other person on these pages is?